​Brick, concrete, and granite monument dedicated sometime in the l960s. City Park, West Main Street, Woodston, Kansas. 1970s Grey granite monuments flank a stone Civil War statue. 300 North Water Street, Stockton, Kansas. List of Rooks County military veterans from the Civil War through Desert Storm. It was dedicated on May 30, 1994. 115 North Walnut Street, Stockton, Kansas. A recreation of the outdoor Memorial, found in the main hallway of the Rooks County Courthouse. Granite monument erected in the 1970s. In Memory of All Veterans Who Served Their Country In Its Time of Need Donated by VFW Post 8873 and Women’s Auxiliary. North Cypress Street, Stockton, Kansas. 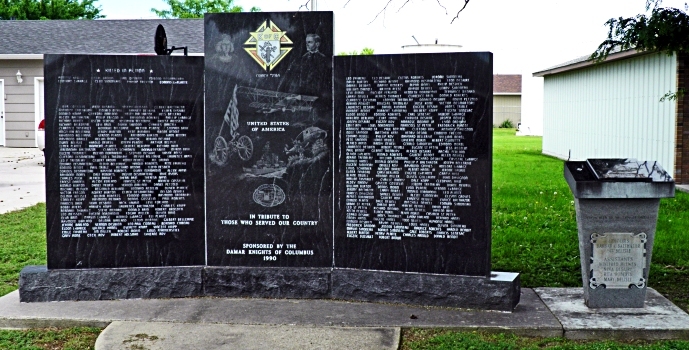 Black granite monument with names of area military veterans. United States Of America In Tribute To Those Who Served Our Country Sponsored By The Damar Knights Of Columbus 1990. NE corner of Maple and Main Streets, Damar, Kansas.